There is 1 review for 'Chronus Arc'. 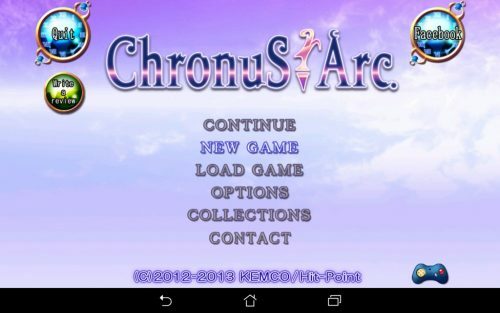 I really enjoyed the gameplay of Chronus Arc. I looked forward to every puzzle and solving the challenge of each of them. The puzzles in this game added a whole new flavor to the standard fare of RPGs. The puzzles presented a range of difficulties and they never seemed to be boring even though they were similar. True to old-school RPGs, we get to interact with enemies on the World Map. We can warp to any town or dungeon we previously visited from the World Map. Don’t EVER take that feature for granted. If you’ve ever done without a warp ability, then you know exactly what I mean. One of the hottest, if not “the” hottest, features in the game is the Class change system. Each character can learn an additional five Classes. The Class components (ie magic) aren’t very diverse or the components do not exist (ie equipment variances). Despite those disappointing traits, achieving the different Classes is fun to do. Mining, while not a wow-factor, was kind of like a poor kid’s Christmas. You knew you weren’t going to get much, but you don’t care. You were happy to get something and you were real curious to see what it was. NPCs take on somewhat significant roles in this game. That was a first for me. It’s not good or bad. It’s just different. We do have to go deep into the menus to perform actions, even for simple healing spells or for using items. That is just unnecessarily time-consuming. Even in the Help section, we can’t just choose what to see. We have to click and read a bunch of stuff. Not only that, but there is no side bar to scan info. So we have to go through all that clicking and reading only to discover we’re in the wrong place and have to do more unproductive and redundant work somewhere else. Lots of time-wasting. Hit•Point has other games that way. I’m baffled as to why they can’t make menus user-friendly. My biggest issue with this game is the so-called Treasure Chests. Most of the time, and I really mean “most,” the treasures have items of absolutely no significance to the game or forward progression of it. NONE!! It’s the same way for some boss battle rewards. Why have treasures when they cannot be used in the game at all or used to reward the player? Why have “Collections” to complete when they do not contribute to the game’s progress or reward the player? In a word, it’s all stupid. The story is so linear, that it’s shockingly unimaginative in that regard. You can’t get lost, not even in a dungeon, and you will never wonder where you are or what you need to do. The only redeeming qualities of the story are the character development and plot twists. If not for those, I’d have to leave the stars blank at zero. The characters and the plot twists are interesting enough to make this section worthy of a two-star rating. The bosses seem inordinately difficult for the typical gamer. Boss battles are manageable for those who like to grind and stay leveled-up throughout the game. For the average gamer who “just plays” and moves on to the next game, or for those who refuse to grind for more than 15 minutes, the bosses in this game may present a near-impossible challenge. The real problem with that design, is once you’re, say, 20 minutes into an area that takes 1.5 hours to complete, you’re OP and everything becomes boring and lackluster. Yet, in order to beat the bosses, you have to do things that way. It’s all backwards. The enemies are significantly harder when moving to the next area/location. In contrast, the enemies do not change, nor do they get increasingly difficult, within the same dungeon. There are no special attacks like combo skills or unisons. There are such things called Techniques. Techniques boost Magic spells. That’s excellent. But Techniques do not boost “Special Skills” even if they are magic-based. Such an odd concept. I will always be a fan of weapon and armor crafting. We get an excellent and perfect dose of forging and reinforcing in Chronus Arc. I took a star off because of one thing: Alloy. Late in the game, we are required to farm for a ridiculous amount of Alloy, which is a rare find. The real problem with it is, by the time you get a short way through the equipment reinforcement trees, you’re OP enough to take on the final boss without getting the last half of Alloy you would think you’d need. Why have all the skill trees and farming if we don’t even need to put them into use? Sometimes I think that this game lacks compassion from the devs. It’s like there were a few great concepts that were borne, like Class obtainment, weapon crafting, and puzzles. (And for me… I mean for my friend… Master Teth is a great concept. But they should have made the graphics for him crystal clear. At least for HIM, imo. But I’m a girl. And I think I just contradicted the whole “my friend” theory.) Outside of the few great concepts, the rest of the space was plugged up with worthless treasures, unnecessary battles, and unnecessary dialogue. Such a waste of talent. I wrote a considerable amount of the Walkthrough for Chronus Arc. I used some artistic license to add depth to the story, and I do hope that comes through for you. There was so much potential for the making of this game, that I felt compelled to bring some life and color, if I could, to the fun of playing it. I DID have fun playing it, and I would like for you to have fun, too. Regardless of how scathing some of this Review may seem, I enjoyed the game. I’m really old-school, though, so this game is right up my alley. For gamers who enjoy more modern or more richly written stories, I have a difficult time recommending this game to you without some warning. This Review is for YOU, not me. So it doesn’t matter how much this game suited me. Besides, for my own purposes, I don’t care what is in this game. If I only saw Teth with every click, I’d have no complaints. Although, it would be amazing if he was in the party. Then he could battle. He’s so … strong! If you’re patient enough to play freeium, this game is worth the time of any RPGer or Kemco fan. For me, $8 USD is way too steep for what we got out of the game. This game is worth $3-4, and $5 if you’re generous.